There were 135,000 Midianites & associates, plundering the land, stripping the crops and polluting. They were terrorizing the people of Israel. Up to this time, Gideon served his role well as a farmer and father, struggling to provide for the needs of his people and threshing his wheat in the winepress in order to avoid having to hand it over to the raiders. But he did not stand up to them, nor rally his people to resist them and drive them out. But after God called him and confirmed his calling through the putting out of the fleece, Gideon found strength and inspiration from the Spirit of God. His people were inspired by his leadership. They rallied around him and gained courage to face their oppressors. Once God’s will was confirmed, Gideon wasted no time in getting to the task at hand. Look at verse 1. “Early in the morning, Jerub-Baal (that is, Gideon) and all his men camped at the spring of Harod. The camp of Midian was north of them in the valley near the hill of Moreh.” Whenever we see, “early in the morning” it means he did not hesitate. He was not one to linger while the enemy got away or got a foothold. This attitude is found throughout the Bible in the hearts of those who have been called to serve God’s purpose. The point is, do not hesitate and do not linger. Follow the Lord when he calls you. God works through thrusting us into situations that are beyond our human abilities. We always have to leave “God room” in our lives. According to Franklin Graham, in his autobiography, ”Rebel with a Cause”, he states that “God room” is when we embrace the immense task that God has put before us, and we try our best to accomplish it with all of our strength and resources and yet we find that is not enough. It is then that you have to pray and trust in God and step out in faith and obedience, embracing the challenge. Then you will see God working. This is leaving “God room” in your life and ministry. The problem is that we have such great human abilities, but we only embrace what we know that we can accomplish without God. Then God is not glorified in our lives. We are glorified instead. We must seek to make God room in our lives and ministry by embracing the great will of God. Establishing a Christian campus ministry, based on 1:1 Bible study and disciple raising is a task beyond my human ability, beyond all of our abilities. But God wants to work though us to reveal his glory. When we are weak then God is strong. When we are helpless and depend on God, then God can work to do great things through us. Jesus Christ must be advertized in our lives and not ourselves. And so God began to help Gideon glorify the Lord. Look at verses 5-7, “So Gideon took the men down to the water. There the LORD told him, ‘Separate those who lap the water with their tongues as a dog laps from those who kneel down to drink.’ 6 Three hundred of them drank from cupped hands, lapping like dogs. All the rest got down on their knees to drink. 7 The LORD said to Gideon, ‘With the three hundred men that lapped I will save you and give the Midianites into your hands. Let all the others go home.’” What impression do you get from these people? They went down to the river’s edge, always wary of the enemy’s presence. They cupped the water with their hands and lapped like dogs. They let nothing get into their line of vision of a possible ambush. They were prepared people with a heightened sense of alertness. The Bible teaches us that we should always be alert. The fact is that the devil is prowling around like a roaring lion looking for someone to devour. (1 Peter 5:8) We should never be overconfident in ourselves lest we fall. To be vigilant all of the time is a good thing. It is not always possible. In our struggle against sin, in our vigilance to follow Jesus we falter. How many of you have actually said, “I don’t care anymore. I don’t care what happens to me.” I have said that many times. But thank God that when we can not be vigilant all of the time, Jesus is vigilant for us. This is not a cop out. We must hold onto Jesus. He is with is 24/7. He is our strong tower. (Prov 18:10) He prays for us and dwells in us as we live by faith. God also sends us his angels to show us that he is with us. Think about Jacob in Gen 32:1. He was about to meet Esau. This was the most fearful moment of his life. But God encouraged him with a vision of the angels. Elisha saw the angels of God encircled around him. (2 Kings 6:17) The point I am making is that God is with us. When we are faltering and giving into sin and this world, Jesus helps us to stand by his power. God chose 300 men who met his criteria. Look at verse 7, “The LORD said to Gideon, ‘With the three hundred men that lapped I will save you and give the Midianites into your hands. Let all the others go home.’” Here is a little side note. The recent movie, “300” depicted the events of The Battle of Thermopylae, which was fought between an alliance of Greek city-states and the Persian Empire, over the course of three days, during the second Persian invasion of Greece in 480 BC, at the narrow coastal pass of Thermopylae (‘The Hot Gates’). Gideon’s battle took place around 1146 B.C. And so this passage in the Book of Judges may very well have been the inspiration of the Spartan king for choosing the number of men he did. I can’t prove this. But isn’t it amazing to know that the Bible plays such a prominent role in history? What a privilege and honor it is to be counted among the 300. It is such a great honor to be chosen by God. 1 Peter 2:9, “ But you are a chosen people, a royal priesthood, a holy nation, a people belonging to God, that you may declare the praises of him who called you out of darkness into his wonderful light.” Jesus once said to his disciples, “You did not choose me, but I chose you and appointed you to go and bear fruit—fruit that will last….” (Jn 15:16a) Who are we that we should be called children of God? (1 Jn 3:1) In this world, without Jesus, we feel insignificant. Our lives are like a puff of smoke here today and gone tomorrow. On my own I can be an ultra ordinary man with ultra ordinary hopes and dreams, simply struggling with my sins and to survive in a merciless world that only smiles upon me when I have money. That would literally be my reality outside of Jesus. But in Jesus we are special people of God, servants of Christ, chosen by God to fight the spiritual battle alongside our commander and chief, Jesus Christ. What a privilege and honor it is. Look at verse 7 again, “The LORD said to Gideon, ‘With the three hundred men that lapped I will save you and give the Midianites into your hands. Let all the others go home.’” 31,700 left. It is OK that the others went home. Even though they were not required to fight on the front lines of the spiritual battle they were still essential in the work of God while living on the home front. They would go home and protect their villages and cities. They would have to take care of widows and orphans left behind by those killed in battle. They would prepare and send supplies to the front lines. Most importantly they would pray. Later on they would be called upon to pursue a fleeing enemy. They were not any less important. The armies of the Lord need both kinds of servants. God has an important role for us all. When we are in Christ, we are not just a missing part. In the movie Hugo the mechanical robot needed a needed part and a key to operate. Hugo was always looking for the right pieces to fix the robot. The principle of the storey is that each person is a necessary part. Hugo did not want to be a useless part. He did not want the old man to see himself as a useless part. And so he set out to help the old man see his worth. We are all useful parts in Jesus. God helped Gideon and his men to overcome their fear. Look at verse 8b-9, “…Now the camp of Midian lay below him in the valley. 9 During that night the LORD said to Gideon, “Get up, go down against the camp, because I am going to give it into your hands.” Gideon was worried about fighting the Midianite hoard with only 300 men and who could blame him? God helped him by planting in his heart a promise. Look at verse 9b, “…the LORD said to Gideon, “Get up, go down against the camp, because I am going to give it into your hands.” God is assuring Gideon of victory, even before the battle. God’s command is always accompanied by a promise. Jesus gives us commands. In one command, Jesus told his disciples to love each other in John 13:34, “A new command I give you: Love one another. As I have loved you, so you must love one another.” The promise is, “By this all men will know that you are my disciples, if you love one another.” Another command is Jesus’ world mission command. “ He said to them, ‘Go into all the world and preach the gospel to all creation.’” And the promise is, in verse 16, “Whoever believes and is baptized will be saved…” .There are more commands of God and they all come with a promise. God also confirmed his presence through helping Gideon hear the dreams of others. Look at verses 12-15. God led Gideon to slip into the enemy camp and overhear the conversation that would bring him courage. An enemy soldier dreamed of a loaf of barley bread tumbling into the camp. This dream was a prophetic statement from God, concerning what he was going to accomplish through the 300 warriors. Barley was only half of the value of wheat, and the bread made from barely was also considered inferior. Also, the tumbling bread should not have enough momentum to bring down a durable military tent. In the same way, Israel’s band of 300 men was considered vastly inferior to forces of Midian and Amalek. But God would make the “underdog” invincible. God gave him wisdom. What God was asking them to do, did not make sense at all. What sense did it make to approach this vast army with only 300 men, not matter how skilled they were? What sense did it make to have both hands of each man filled with a torch and a clay jar? What sense did it make to have them stand there and yell simply holding a torch and not even drawing a weapon? From a human point of view, it made no sense at all, but from God’s point of view it made perfect sense and it was the way to assured victory. I tasted victory in my student life and in my spiritual life when I obeyed God’s way that did not make sense at first. I was a student/shepherd. I participated in every aspect of ministry while serving Jesus at Triton UBF. Life in ministry took a lot of time. I was pressed for time to complete the readings of nursing. But God blessed me. I could get my bachelor’s degree and a career that is recession proof, which provides me with a good income, exercise, a clean environment, lots of opportunities for ministry, and the good council of a dozen of Christian women. Julie and I met through the prayers and introduction of two pastors. After praying, we married and dedicated our family to serving Jesus. That was 20 years ago. It is a success story. The way we got married did not make sense in the eyes of the world, but it was God’s wise way and a great victory. Having a family with five kids did not make sense. Some people told us not to. We were poor. But by faith, we had a large family, trusting that he would provide. We decided to live on love, God’s love, and God has blessed us. It did not make sense in the eyes of the world, but I consider the family God has given us a great victory and a great testimony in this world. God has provided what I could never accomplish in my own in this world. Recently, God has given me victory over my spiritual enemies of depression and anger. How? It was through the Gospel of Jesus, the word of God, prayer and the counsel of other Christians. Secular people would say that it does not make sense to overcome in this way. But God worked in this way and helped me to overcome. Are you facing a battle? God can give you the strength you need for any situation. We should not be surprised at the way that God helps you. Like Gideon we must listen to God and be ready to take the first step. Only after you begin to obey God will you find the courage to move ahead. We can see the further outcome of God’s strengthening of Gideon’s heart in verses 19-22, “Gideon and the hundred men with him reached the edge of the camp at the beginning of the middle watch, just after they had changed the guard. They blew their trumpets and broke the jars that were in their hands. 20 The three companies blew the trumpets and smashed the jars. 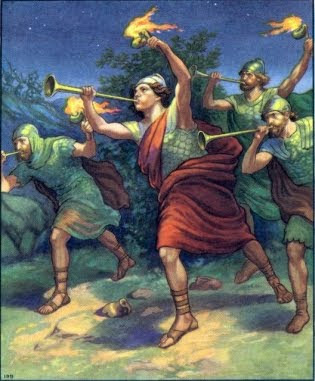 Grasping the torches in their left hands and holding in their right hands the trumpets they were to blow, they shouted, “A sword for the LORD and for Gideon!” 21 While each man held his position around the camp, all the Midianites ran, crying out as they fled. 22 When the three hundred trumpets sounded, the LORD caused the men throughout the camp to turn on each other with their swords. The army fled to Beth Shittah toward Zererah as far as the border of Abel Meholah near Tabbath.” The men approached the edge of the camp. As one man, they broke the clay pots that were hiding the light of their torches and they yelled out, “A sword for the LORD and for Gideon!” I am not sure what weapons they had. Maybe none! They had faith to stand. Each man held their positions around the camp. It was not easy to hold your position. Most people would be shaking in their boots and ready to run. Yes, they were scared. They were human. But they we men of faith and they overcame and held their position. This took courage. Unless each one held their position, they could not win the victory over the enemy. God has called us to hold our position. Each of us has a position on the work of God. Jenn and Augi sing praise and worship. I preach. Mark does readings and sings. Hope and Sarah pray and play piano. Steve shares his testimony. James provided IT equipment. Julie is the general manager. This ministry can not stand unless each person holds their position. When we can not hold our position, Jesus is there to help us hold it. When we do this by faith, then God gives us the victory. Then came the assault on the enemy camp. It was about 10 pm. The Midianite army never expected such an advance by inferior numbers. When they heard the breaking of the clay pots, the flaring of the torches, and the yelling of the men in unison, they were in shock. God was working within them. They felt surrounded and overwhelmed. They turned on each other. There could have been loose alliances among them. Some groups may have felt that they were about to loose the battle against the Israelites and turned “turncoat”, changing sides. Gideon’s army simply watched as the army of Midian fell into panic and confusion and into a disordered retreat. Not one man had to draw his sword to defeat the enemy forces. Later on, the people who had been taking care of the home front, chased the retreating arming, making their victory complete. Gideon’s small army could never have brought about such a victory in their own strength. God wanted to demonstrate that victory depends not on strength in numbers, but on faith and obedience and commitment to God. In conclusion, we learn that God wants us to exercise our faith and render all glory and honor to Jesus. Sure God can use our own human abilities. These are our talents that God wants us to use. But beware of the danger. The danger is trusting in them and not trusting in God. We rob God of his glory. We also rob ourselves of experiencing God’s power and deliverance through our struggles. Always remember that God will encourage us through his commands and promises. He will show us signs. Jesus will bring about spiritual victory in our lives, in our mission and in our hearts. « The Script for the NIU UBF 2012 Report for the North York UBF Spring Conference.